Stephen Colbert, Al Roker, and Jeff Foxworthy lend their voices to longest-running public service initiative in United States history. WASHINGTON—In honor of Smokey Bear’s 75th birthday (August 9, 2019) the USDA Forest Service, the National Association of State Foresters, and the Ad Council have teamed up to celebrate the nation’s favorite bear. To ensure Smokey Bear’s important message of wildfire prevention is heard throughout the nation, Stephen Colbert, Al Roker, and Jeff Foxworthy have joined the historic campaign, lending their voices to expand on Smokey’s iconic “Only You” catchphrase. Smokey Bear has only said a handful of words over the last 75 years. Now, to complement this signature message “Only You Can Prevent Wildfires” (voiced by actor Sam Elliott for the last 12 years), Smokey’s famous friends are utilizing cutting-edge facial recognition and mapping technology to speak through him—with their instantly recognizable voices—about the importance of fire safety and wildfire prevention. For 75 years—longer than any other PSA program in U.S. history—Smokey Bear has been recognized as a symbol of wildfire prevention. This year’s campaign was created in conjunction with advertising agency FCB, who has developed Smokey Bear campaign assets pro bono since Smokey was introduced in 1944. Since then, great strides have been made in preventing human-caused wildfires with Smokey’s help, but his work is not over. Wildfires continue to be one of the most critical environmental issues affecting Americans, and on average, are started by people nearly 90 percent of the time. Smokey Bear first appeared on a forest fire prevention campaign poster in 1944. Two years later, he and his message were featured on a series of stamps used nationwide, and by the 1950s, Smokey Bear had made his debut in radio commercials voiced by Washington radio personality Jackson Weaver. In the decades since, the beloved icon has been featured in countless TV and radio spots, posters, stamps, billboards, and memorabilia alongside well-known actors and celebrities including B.B. King, Barbara Stanwyck, Betty White, Dolly Parton, Leonard Nimoy, Ray Charles, and Ted Nugent. The new creative is being distributed to media outlets nationwide and will run in donated time and space, per the Ad Council’s model. 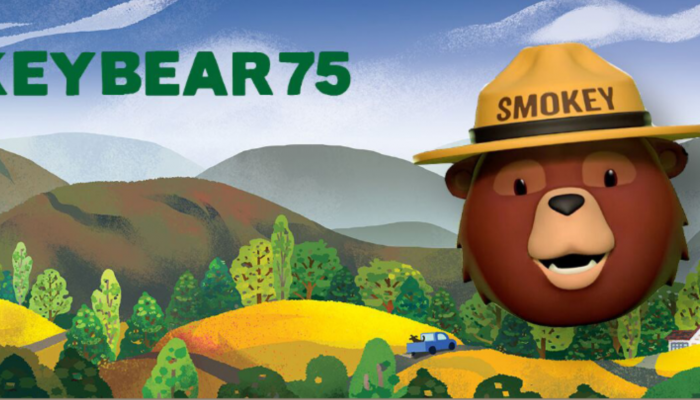 To learn more about Smokey Bear and wildfire prevention, visit SmokeyBear.com and follow Smokey on Facebook, Instagram, and Twitter with the hashtags #SmokeyBear75 and #OnlyYou. The Forest Service is the agency responsible for overseeing the use of Smokey Bear in cooperation with the National Association of State Foresters and the Ad Council. The Forest Service manages 193 million acres of national forests and grasslands for the American public. Its mission is to sustain the health, diversity, and productivity of the nation’s forests and grasslands to meet the needs of present and future generations. With more than 140 years of communications expertise, FCB’s worldwide network spans 150 offices in 90 countries, with over 8,000 people, and is part of the Interpublic Group of Companies (NYSE:IPG). For more information, visit www.fcb.com and follow us on Twitter and Instagram (@FCBglobal) and Facebook (FCB Global).